Sports Medicine is a medical sub-specialty that diagnoses, treats and prevents sports-related injuries and advances the science of exercise. 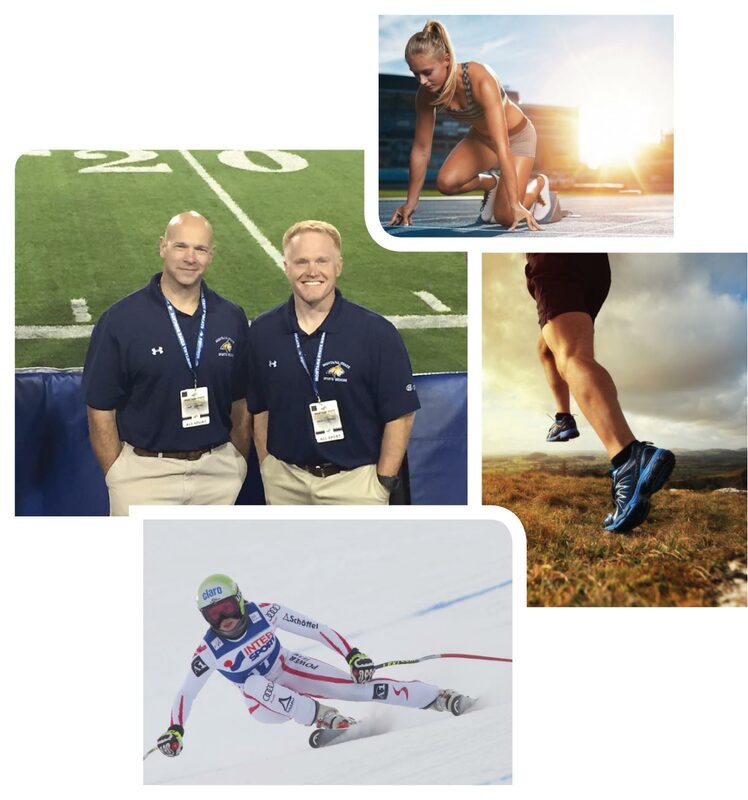 While sports medicine is usually perceived as a discipline concerned with repairing athletes’ traumatic injuries, this medical science is much more encompassing. From the weekend athlete to the marathon runner, anyone who participates in exercise can benefit from the knowledge and skills of a dedicated team of professionals with a long history of successful experiences resulting from decades of caring for aspiring athletes as well as active individuals of all ages. WHAT IS A TORN ROTATOR CUFF? The rotator cuff is a group of tendons and their related muscles that help keep the shoulder and upper arm bone securely placed into the socket of the shoulder blade. The rotator cuff stabilizes the shoulder joint and helps you to raise and rotate your arms. A stage 1 tear is a partial tear less than 1 cm in size. It is accompanied by some pain following overhead arm movements, but range of motion is not limited. A stage 2 tear is a partial tear greater than 1 cm but less than 5 cm in length. Pain is common during and after overhead arm movements, as well as at night. It may be accompanied by a slight decrease in range of motion. A stage 3 tear is a full tear greater than 5 cm in size. Stiffness, weakness, and pain occur during and after overhead arm movements and during sleep. There may be a slight to severe decrease in range of motion in the shoulder. Frozen shoulder (adhesive capsulitis) is a condition in which the tissues around the shoulder joint stiffen, scar tissue forms, and shoulder movements become difficult and painful. It can develop when you stop using the joint normally because of pain, other injury, or a chronic health condition, such as diabetes. Any shoulder problem can lead to frozen shoulder if you do not work to maintain its full range of motion. WHAT IS A SEPARATED SHOULDER? A shoulder separation (acromioclavicular joint injury) occurs when the outer end of the collarbone separates from the end of the shoulder blade because of torn ligaments. This injury occurs most often from a blow to the shoulder or a fall on a shoulder or outstretched hand or arm. WHAT IS A TORN ACL? MCL? There are four ligaments in the knee: the anterior cruciate ligament (ACL), posterior cruciate ligament (PCL), medial collateral ligament (MCL), and lateral collateral ligament (LCL). The ACL and PCL stabilize front-to-back knee movements, while the MCL and LCL stabilize side-to-side movements. The ACL can be sprained or torn if the knee is straightened beyond its normal limits (hyperextended), twisted, or bent side-to-side. A sprained or torn ACL is common in sports and usually results from a hard stop or aggressive twisting of the knee. The PCL is the least common ligament to be injured. The MCL is injured when a force is exerted on the outside of the knee, pushing it inward, while the LCL is injured by a force exerted on the inside of the knee that pushes it outward. This type of hit is frequent in contact sports like football or hockey. A torn knee ligament is usually accompanied by feeling or hearing a pop in the knee at the time of injury, severe pain and swelling, and joint instability. WHAT IS A TORN MENISCUS? The medial and lateral menisci (plural of meniscus) of the knee are two crescent moon-shaped disks of tough tissue that lie between the ends of the upper leg bone and lower leg bone that form the knee joint. Meniscus tears commonly occur during sports when the knee is twisted while the foot is planted firmly on the ground. In people over the age of 40 whose menisci are worn down, a tar might occur with normal movement, minimal activity, or minor injury. WHAT IS AN ACL RECONSTRUCTION? ACL reconstruction is a surgical procedure that repairs a torn anterior cruciate ligament (ACL), one of the four ligaments that help stabilize the knee. The ligament is reconstructed using a tendon that is passed through the inside of the knee joint and secured to the upper leg bone (femur) and one of the two lower leg bones (tibia). The tendon used for reconstruction is called a graft and can come from different sources. It is usually taken from the patient's own patella, hamstring, or quadriceps, or it can come from a cadaver. ACL reconstruction is most often performed through arthroscopic surgery. WE ARE PROUD TO BE MSU’S OFFICIAL TEAM PHYSICIANS. WE ARE MSU ATHLETIC SPECIALISTS. 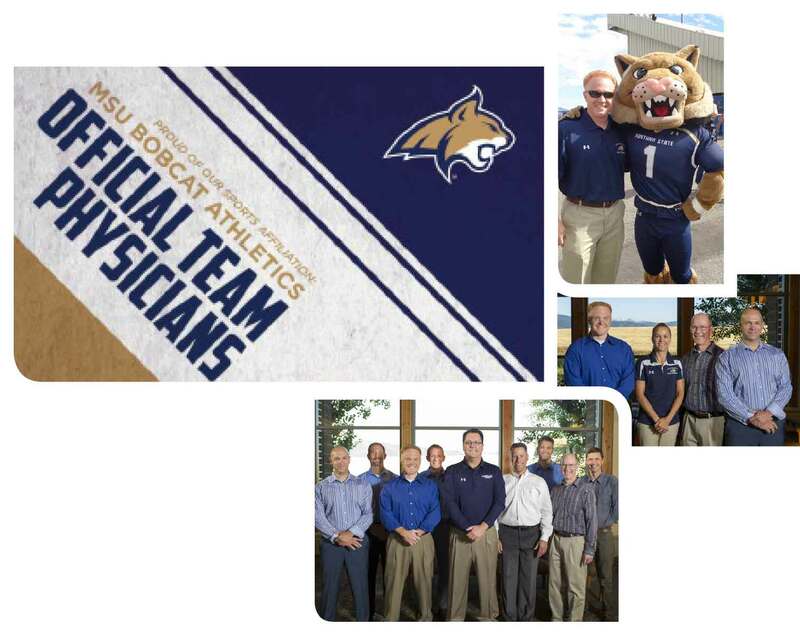 It is with great honor, that we share with all of you that are relationship with Montana State University is a long-standing one. For years we have served as the Official Team Physicians for all Athletic Programs. Today, we have built upon this relationship and going forward will also be providing Occupational Medicine and Medical Surveillance Services to the University. GO CATS!